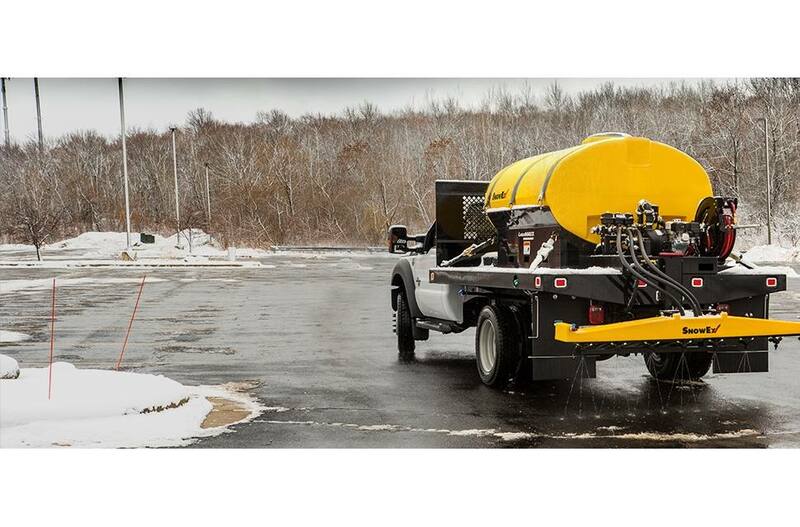 Modular Design : The tank, pump and boom assemblies are interchangeable. Users can customize the system according to their needs, and then upgrade individual components later. Deluxe Control: With the deluxe control, the Liqui Maxx can use optional GPS speed sensors to calculate the ideal application rate and then automatically adjust the flow rate as needed. 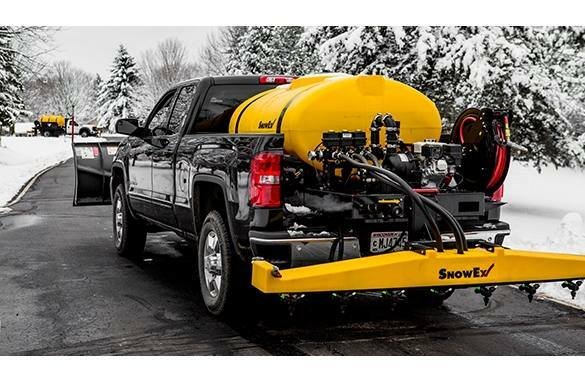 It features 3-zone spray capability. 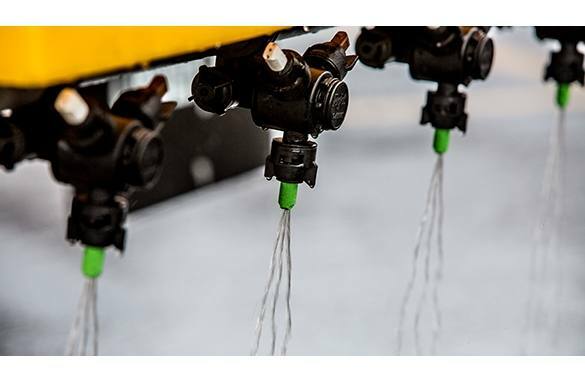 Standard Control: Featuring 3-zone spray capability, the standard control and pump system has toggle switches that turn the spray zones off and on for simple, no hassle operation. Electric Start: For operator convenience and to help conserve fuel, the deluxe model's electric start allows users to start/stop the engine and operate the choke right from the cab. Elliptical Tanks: The elliptical tanks have a low center of gravity for improved vehicle control. Adjustable Nozzles : The boom offers three nozzle sizes on a rotating assembly, and the wing nozzles can be manually adjusted for direction and flow control. Dry-Seal Pumps: Engineered specifically to handle brine in harsh conditions, the dry-seal pumps are properly filtered and feature a low-water shutoff for maximum durability. HONDA® gas-powered and hydraulic motor-driven pumps available. Poly Boom : The 3-zone poly boom offers superior rust resistance against highly corrosive materials. Hydraulic Pump: Hydraulic motor-driven pump includes durable dry seal with low water control valve for run dry protection and spool valve for consistent pressure and flow. Hose Reel Kit: Great for stairs, curbs or sidewalks, adds spot spraying capabilities to the unit. Bolts directly to the sprayer frame and includes spray wand with 100-foot hose. GPS Speed Sensor: The optional GPS speed sensor is used to communicate vehicle speed back to the Deluxe Control. 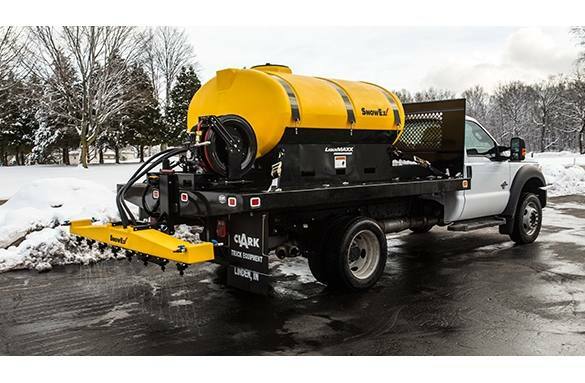 Then, the system automatically adjusts the flow rate as needed, making anti-icing and de-icing application easier than ever. Work Light Kit: Adds work light to the pump platform. Plug and play, leverages existing vehicle harness. Strobe Light Kit: Adds dual strobe lights to the rear of the tank. Plug and play, leverages existing vehicle harness. Accessory Nozzle Kits: Additional nozzle options for meeting target application rates. Universal Mount Kit: This kit includes ratchet straps, brackets and hardware for mounting a sprayer in a truck bed. Boom Mount Kit : Provides an adjustable 2" drop receiver that mounts to the pump platform, great for large or very tall vehicles or those without an existing 2" receiver.